Where are the they now? A list of where the NPCs are now and what happened in the 10 years between the show and the site. Twilight: Twilight lives in Canterlot as she is now, of course, a princess. She runs the Celestia's School for Gifted Unicorns as she was once a student there and is also gifted in magic. She usually doesn't leave her spot as princess unless she is called to be the Element of Harmony or is visiting her friends or Ponyville. Spike: He is still Twilight's assistant, only he has grown up! Now about the size of a teen-age dragon, he has also grown his wings. While he might have grown bigger, and gotten a bigger love for gems, his foolish love for Rarity is still the same. Pinkie Pie: Pinkie Pie still lives in Ponyville, being the same old Pinkie Pie. Age hasn't changed a thing in the lovable pink party mare as she helps runs Sugarcube Corner a bit more now. Rarity: Rarity got her dream, working in Canterlot as one of the most top fashion designer. However, sometimes she finds her job just to stressful and will take trips to Ponyville to visit the old town, and visit her sister and her old friends that still live there. Rainbow Dash: Now part of the Wonderbolts, she is living her awesome dream. Traveling the world, she is the pony most distance from her friends. 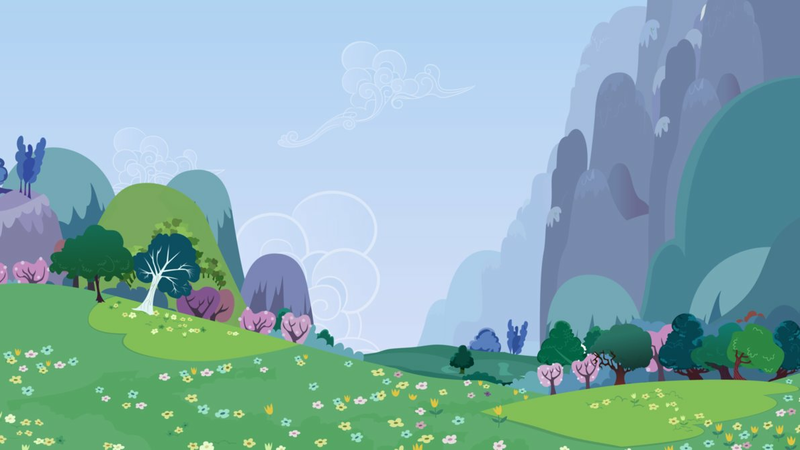 However, whenever she returns to Canterlot or Ponyville, she always visits her friends when she can. Applejack: Applejack still lives in Ponyville, but is now in charge of Sweet Apple Acres. She looks at her young sister Applebloom while still taking good care of the farm with her bother, Big Mac. Fluttershy: Not much has changed in Fluttershy, other then she is a little more open with new faces, but not by much. Still the animal-lover that everypony in Ponyville loves, she happily takes care of ponies' sick animals. Big Mac: Not much changed in Big Mac, he is still the quiet, large stallion he ever was. Applebloom: Applebloom, now a fully grown mare, is no longer a Cutie Mark Crusader. However, she does help out with them when she can as their club house is still at the Sweet Apple Acres. Her Cutie Mark is a heart-shaped apple. Sweetie Bell: Living alone at the Carousel Boutique, Sweetie Bell runs it in place of her sister. She however, doesn't make the outfits, and spends her free time foalsitting Melody if she isn't writing songs. Her Cutie Mark is a pink bell. Scootaloo: Now wishing to be a Wonderbolt like Rainbow Dash, Scootaloo spends all her time working on flying. However, she isn't the best at it and ends up crashing a lot, making her a face that you see a lot at the Ponyville Hospital. Her Cutie Mark is a pink and orange butterfly with two small flowers on either side. Cup Cake and Carrot Cake: Owners of Sugarcube Corner, they aren't seen much as they really just work in the back while Pinkie Pie takes care of everything. Zecora: Still living in the middle of the Everfree, this zebra shaman still hasn't given up speaking in rhymes. Still visiting Ponyville once a month, she is Ponyville's go to zebra when things get ugly and they need a potion or two. Princess Celestia: Still looking the same, not much has really changed in Celestia. Discord: In the 10 years he still hasn't been turned to stone, something amazing for all the chaos he causes for the princesses just for a laugh or two to cheer them up. Princess Luna: Other then being a little taller, Luna hasn't changed much. Other then being more open with her past life as Nightmare Moon, she is the same old princess. Oh, and she still speaks in the old ways, as she 'dislikes' speaking in the current way and that she just isn't that used to it. Princess Cadance and Prince Shining Armor: Other then having a daughter, not much has changed for rulers of the Crystal Empire.